Home > Campus News > Conquering New Milestone! 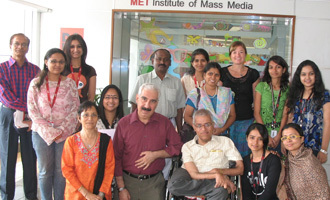 Disability is a matter of perception and once you meet Sankara Raman you would know why. A C.A by profession, Raman is an integral part of the Award Winning Organisation Amar Seva Sangam in Madurai. Raman received the Super Idol Award post his participation in the Standard Chartered Mumbai Marathon 2010, where he managed to complete the Dream run despite being confined to his wheelchair.